One of my New Year’s resolutions is to reduce distractions. It’s about curating your network but allowing time for strategic serendipity. I’ll be writing about that topic in the weeks and months to come. 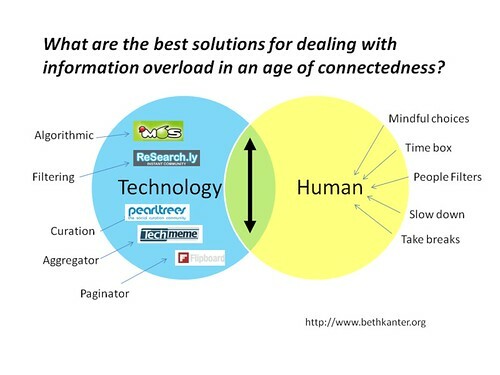 I’ve discovered some wonderful discussion threads about one of my favorite topics: Information Overload and Strategies for Coping. As George Siemens points out the issue of information overload is not new. His definition of the problem is that it gets in the way of sustained mindfulness in order to get something meaningful done. What is the solution? Is it human (habits and skills) or machine (technology/software) or a combination of both? RSS readers worked for us in the early phases of social media, but as more people are connected through social networks and sharing and publishing information, there is more and more information out there. Our simple methods for curation may no longer be effective. There are also new and more sophisticated tools that we can add to our toolbox to deal with the resulting information overload. Robert Scoble outlines different categories of filtering tools that can help you swim through the ocean of noise to find the good stuff. Robin Good has a more comprehensive taxonomy of these tools. Paginator: These tools organize your social sources and streams into neat and organized pages. Tools: Flipboard, Paper.li, and Instapaper. Algorithmic: These tools find sources and people to follow or of interest based on your past choices and use a mathematical formula. Examples: My6Sense and Genieo. Aggregation: These tools aggregate sources/content on a central site. Examples include: Techmeme, Google News, and Huffington Post. My personal feeling is that tools can help, but you need to develop the right habits and skills or else the tools might create more information overload. Scott Berkun suggests that good information coping habits are a must and that tools like Rescue Time are useful because they inform you about your habits so you can improve them. What exactly are those skills and habits? Mindful Choices: Be very selective about your content and the people you follow. Design your system to achieve your goals – whether they are scanning or to produce a specific product. Remember, you don’t have to read every word. Time Box: Setting time limits is important, especially for scanning time. Time boxing – putting tasks or activities into discrete time chunks can help minimize unproductive “bouncing.” This is important if connectedness is giving ADDolas (“Add oh look there’s a squirrel!). So, time box your social network time into short discrete chunks and also allow enough time for projects that require deeper concentration and immersion. It is a balancing act in your calendar and to do list. People Filters: You don’t know need to know everything or be an expert on everything. Identify those people are immersed in a topic or subject matter area and follow them. That way you don’t have to wade through so much useless information to get to the good stuff, unless it is your job. We work in nonprofits and time is our most valuable asset. While Robert Scoble can spend the day scanning the new technology landscape, most of us who work in nonprofits can’t do that. So, why not just follow Scoble or other experts and use that saved time on a mission-driven task? Harold Jarche breaks this down further in his post about Networked Learning. Slow Down: If you are not leaving time to process information because you’re onto the next link or click, then slow down. Pick something to focus on and go deep. It’s better to get it right than go too fast. Take Breaks: There’s nothing like shutting off the damn computer or mobile phone and going for a walk. Okay, even if you don’t shut down and walk around your desk or leave your mobile phone in another room. Another strategy is to take a technology break for a couple of days. It really helps. And when you come back, don’t forget that the delete button can your best friend. This is especially true for non-mission critical items. This is brief talk by Ben Fullterton talks about Finding Balance: Designing for Solitude is not a technophobe’s rant against social media and digital technology. It’s a thoughtful reflection from a designer about how our current “always-on” state impacts our behavior. One issue is that finding solitude – the ability to switch off and contemplate – is becoming more difficult. 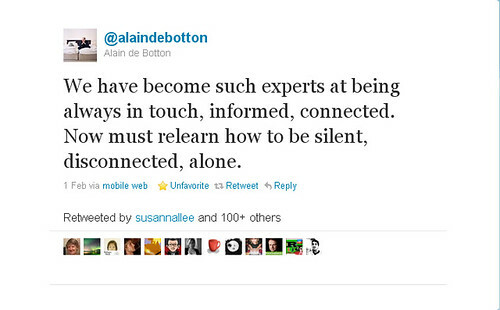 How do you balance connectedness with solitude? What combination of software tools or habits do you use to achieve that balance? Update: Seth Godin has published a terrific post “Lost in a Digital World” suggests the villain is not distraction, but procrastination. “The danger is not distraction, the danger is the ability to hide.” He asks what happens to your productivity when your turn off the digital world? I’m finding that I’m a lot more productive, what about you? Can you add Refynr.com to the Filtering category? Great comments, really critical time to ask what are the long term effects of this sort of overload. The last generation ended up with walkman hearing deficit from overloading eardrums – what is the outcome for overloading the brain? ADOS: Attention Deficit Ooh Shiny! Thanks for the diverse approaches and ideas. I’ve re-thought engagement plans a few times this year with little impact on my energy level, which remains frankly pretty puny. Conversational fatigue continues to endure and it’s time to commit to something more effective. This topic seems one of those that should be learned by now but heck, I continue to revisit over and over. All to say Beth, grazi! Happy 2011 to you. Reducing distractions from information overload, I admit has kept me up some nights and is taking away valuable time during the day by now one would think I have done something about it, but not. Your well thought out categories along with actual tools has inspired me into action. Developing the right habits will be a difficult task as will be time limits and filters. Each day I start in the early AM and before I know it its 1PM and all I have done is read and a good portion I could have done without, this can’t go on. I am going to check out the tools you listed and develop better habits. I think once I am comfortable that I am getting all the information I need in any given category from one or two sources will make being selective possible…on to the tools than I am going totally disconnect for a few hours! Anyway, thanks for the inspiration. Great ideas here, and definitely something that I’m trying to constantly improve upon. Sometimes I feel so wrapped up in monitoring topics and filtering information for my job that I get disconnected from other basic news events of the day. I have been frustrated by this for awhile now, trying to figure out how to balance my time and energy to create a more well rounded intake of daily news and current events while also continuing to grow the number and quality if the people I connect with. Paper.li caught my eye a few weeks ago. I think it is appealing mostly because it satisfies my apparent need to read things in a newspaper layout. As for other tools, the main area I try to modify my behavior and introduce changes is using CoTweet. But I have a few more things I’ll be trying now. Thanks! Great looking diagram, although it’s inspired by Scoble’s incomplete and consumer-centric view on this topic. RSS is still going to be working well for a long time, but maybe it’s becoming a bit more invisible. It’s mixed with feeds from what we are sharing in social media, and is doing the work behind the scenes. As an fyi- I’m the founder of Eqentia, a platform with a mix of human/algorithmic approaches, including page posting, curation, personalization and semantics. But I like the idea of occasional information fasting. It helps one gain a new perspective, and allows your mind to think on its own instead of being bombarded with the toughts of others. May we all be more grounded and present in the year ahead! Love that you’re thinking out loud about this, Beth. I give you a ton of credit for my own “recalibration” over a year ago. Your blogging about this topic gave me the permission I needed to take a deep breath and drop the guilt and pressure around “not keeping up with the information firehose.” Your participation at last year’s Wisdom 2.0 comes to mind, too. The whole conference, actually. Roshi Joan Halifax saying she wouldn’t want to give up her meditation practice OR her twitter account. Twitter CTO Greg Pass’ reflections on twitter-participation AS a kind of mindful meditation practice. Here’s an important point that’s often lost in translation: being grounded, present in the moment, mindfully meditative is all *tremendously* different from thinking about being grounded, present, etc. The only way to be grounded is to be grounded. The only way to be present is to be present. The only way to be mindful is to be mindful. How can I tell I’ve been spending too much time online? I take a moment to be truly aware of myself, and find that my attention settles 90% above the neck. Hope to see you both at Wisdom 2.0, if not sooner! Thank you so much for talking about how we need to shut down and regroup. It’s SO TEMPTING to just get on the computer and stay there all day. But two days off? HEAVEN! I think if I just write enough blog posts and do hootsuite enough, I can walk away with no ill effects! Thank you, Beth, for this to start the new year! I agree that focusing only on the tools (which, obviously, are helpful) misses our responsibility to deal with our own distractions. For me, with 3 (soon to be four) small children who, of course, cannot be “time boxed”, I find that, unless I get some solitude, I can’t be the generous, engaging person I want to be in online communities. So more “off” time is definitely in order. Happy new year to you!